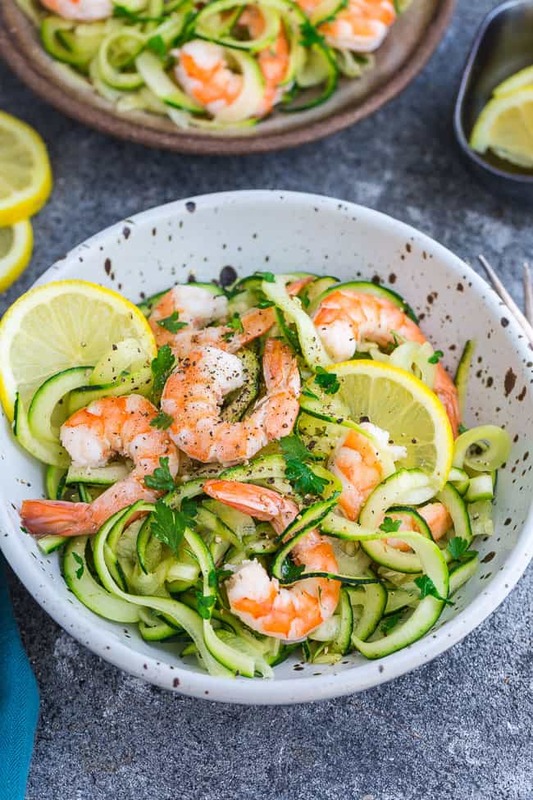 Zucchini noodles with Shrimp makes the perfect light and healthy meal for busy weeknights. Best of all, these low carb and keto-friendly zoodles come together in under 30 minutes with dairy-free options to keep this meal paleo and Whole 30. Are you still looking for ways to use up some of your garden zucchini? Spirallizing them into zoodles can help cut some carbs for a gluten-free, paleo and keto friendly alternative to pasta. And if you don’t have a vegetable spiralizer, you can still make zucchini pasta using a vegetable peeler or a mandoline. 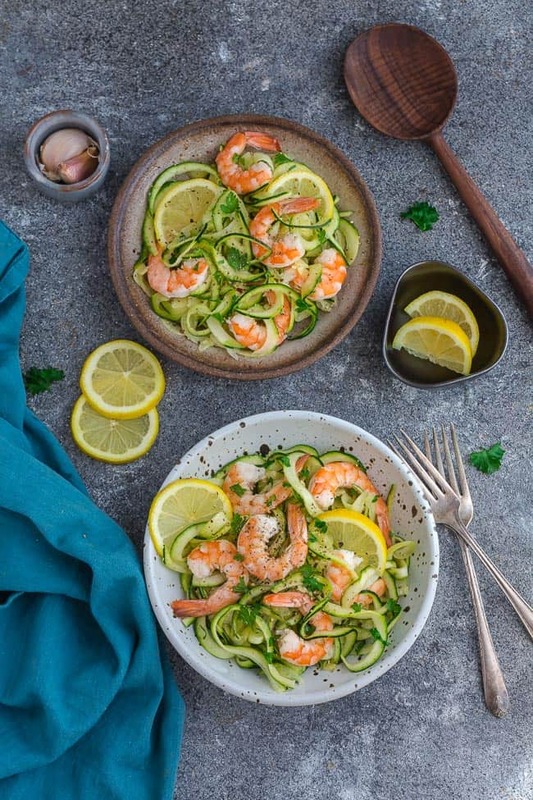 These Zucchini Noodles with Shrimp are fresh, flavorful and perfect when you’re craving a lighter meal for summer. I love swapping out zoodles for pasta since it’s a great way to get your family to eat more veggies. 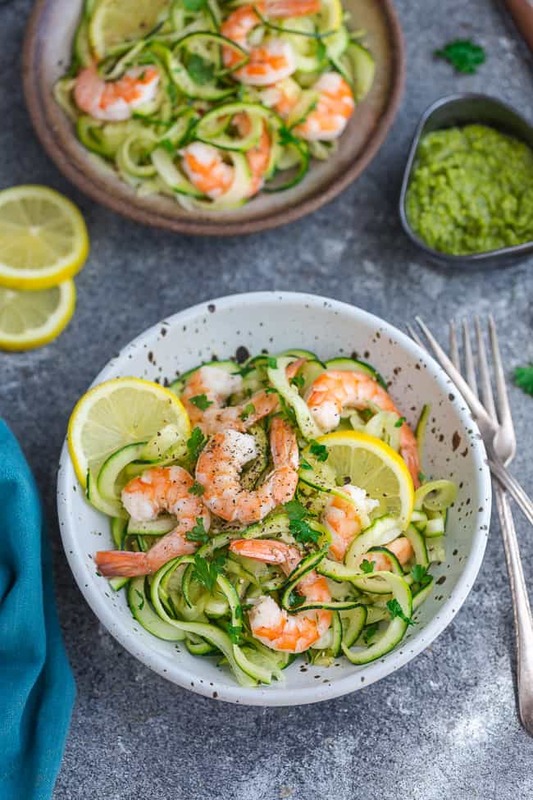 Plus, these simple zucchini noodles with shrimp come together in under 30 minutes making this dinner perfect for busy weeknights. You’re going to spiralize the zucchini and place them in a colander. At this point, you can leave them as is or sprinkle them with some salt and allow to sit for 10-15 minutes. Doing this helps to soak up some of the moisture so you don’t end up with soggy noodles. Pat the zucchini noodles dry when ready to use. Heat a pan over medium heat and add butter (ghee or olive oil for paleo /whole 30). Place the shrimp in the pan in a single layer then add the garlic, lemon Italian seasoning and paprika. Adjust seasonings by adding more salt and pepper as needed. Toss in the zucchini noodles using tongs and allow to cook for about 1-2 minutes. Be careful not to overcook. Remove from heat and serve hot with some chopped fresh parsley. 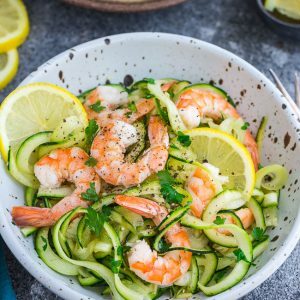 Zucchini Noodles with Shrimp makes the perfect light and healthy meal for busy weeknights. Best of all, this low carb and keto-friendly meal comes together in under 30 minutes with dairy-free options to keep this meal paleo and Whole 30. 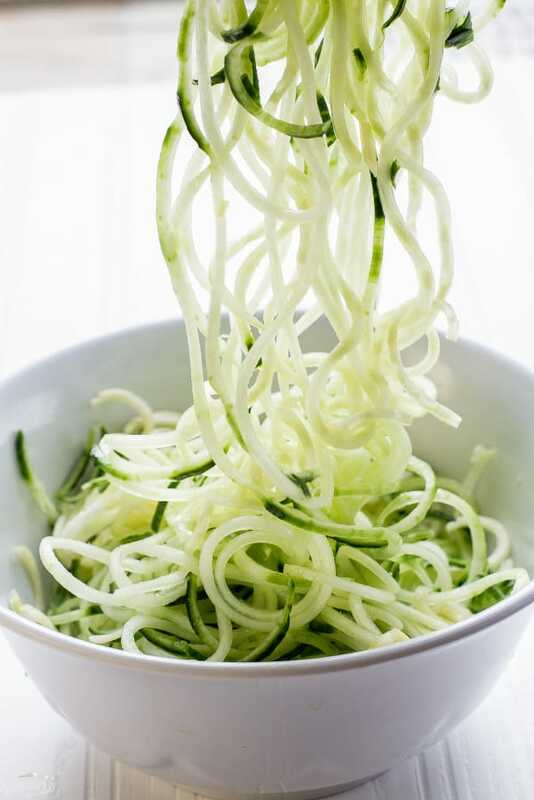 Using a spiralizer, vegetable peeler or a mandoline, make the zucchini noodles. Then, set aside. (You can also sprinkle with salt for 10-15 minutes to remove some moisture - this helps prevent the zoodles from getting soggy. Heat the butter (or oil) in a large pan over medium-high heat. Add the shrimp in a single layer and season with salt and pepper. Allow to cook for about 1-2 minutes undisturbed. Add the garlic, then flip the shrimp and allow to cook for another 1-2 minutes, or until pink and no longer translucent. Add lemon juice, Italian seasoning, paprika and chili flakes (if using). 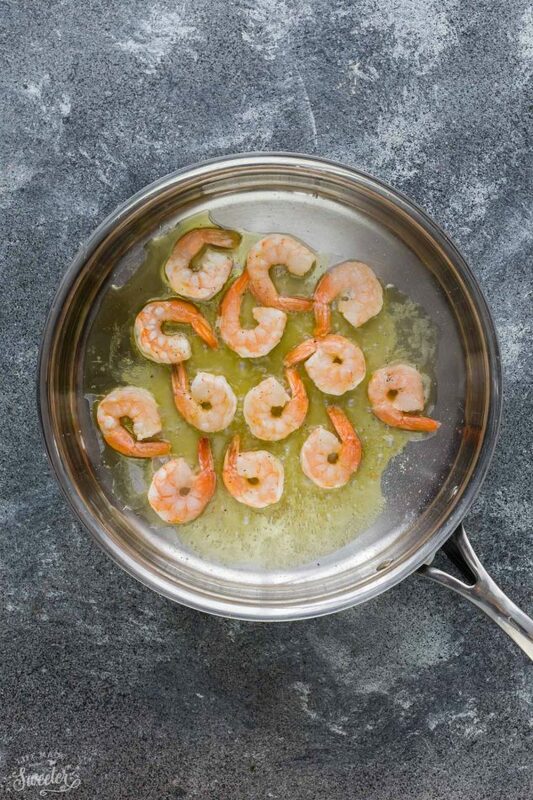 Use tongs to gently transfer shrimp to a plate leaving the sauce in the pan. Add zucchini to the pan and toss for about 30 seconds to a minute to coat. Add the shrimp back to the pan and toss again until everything is warmed through (do not overcook to avoid zucchini noodles from getting soggy). Remove from heat and serve hot with a sprinkle of parsley if desired.